Home » Mutual Funds » How to Switch from Regular Mutual Fund to Direct Mutual Fund? Direct Mutual Funds, as the name suggests, are for direct investor where no intermediary or distributor is involved in making an investment. It makes sense to Direct mutual fund as it provides multiple benefits like low expense ratio, better returns over long-term and elimination of commission. The elimination of commission and lower expense ratio seems to be minimum at first instance, but over the long run, it will make a lot of difference in returns generated by the mutual fund. To know more about a difference in return between a regular mutual fund and direct mutual fund, do read – Why Direct Plans are cheaper? Investors who have realized the potential of a direct plan may have already shifted to them. The Investors who are unaware of benefits of the direct mutual fund might not have moved to direct plan. Even exit load and lock-in period might be a concern to many investors. If you are convinced that direct mutual fund is a better choice compared to regular mutual fund and planning to switch to direct mutual funds this post is for you. In this post, I will share information about switching from Regular Mutual Fund to Direct Mutual Fund – Online and Offline method. However, before making a switch from the regular fund to direct fund you need to consider various important factors affecting this switch. The step of switching from the regular fund to direct fund means an indirect elimination of distributor services. The distributors provide you a consolidated direct platform for an online transaction where you can buy and sell mutual funds. They also remove the need for paperwork. They charge fees for this. If you are moving to direct plan means you will not use services of distributor anymore. So, you have to be ready for handling more paperwork and working with multiple platforms. Second important factor for consideration while switching from regular plan to direct plan is exit loan. Exit load is applicable on redemption of the units which are held less than one year. So, you have to bear applicable exit load on a mutual fund. If you have invested via SIP route, the exit load is calculated from the date of each installment. Once you switch to direct plan new tenure will begin so exit load period will be calculated from the date of switching. If your financial goals are due to mature in short term you should avoid this switch. If you have invested in ELSS, it comes with lock-in period means you cannot switch from these type of fund till lock-in period is over. The lock-in period in ELSS case is 3 years. You also need to consider LTCG (Long-term capital gain) tax applicable on the mutual fund. You must be aware that as per new rule LTCG @10% is applicable to capital gain above 1 Lakh. This rule is applicable from FY 2018-19 onwards. This means if your capital gain is exceeding 1 lakh, you need to start withdrawal in a manner that you will not lose money. Remember for switching also LTCG is applicable. If you have invested via a stockbroker, your stock broker should support direct plans. Please note that switching of a fund from a regular fund to direct plan will not be possible if your stockbroker is not supporting direct plan option. In that case, the only option left with you is redeeming mutual fund and investing it again in direct plans. I hope you are clear about switching of funds. If you need any help you can consult fee-only financial planners. Now, let’s take a look at How to switch from Regular Mutual Fund to Direct Mutual Fund? The offline method of switching fund is given below. This method is applicable for all funds. Visit the office of fund house or respective Mutual Fund distributor. You can get information about registered mutual fund distributor from AMFI website. Ask for the Common Transaction Form for Switching Mutual Fund. If you have CAN at MFU you can also use the form available at MFU website. 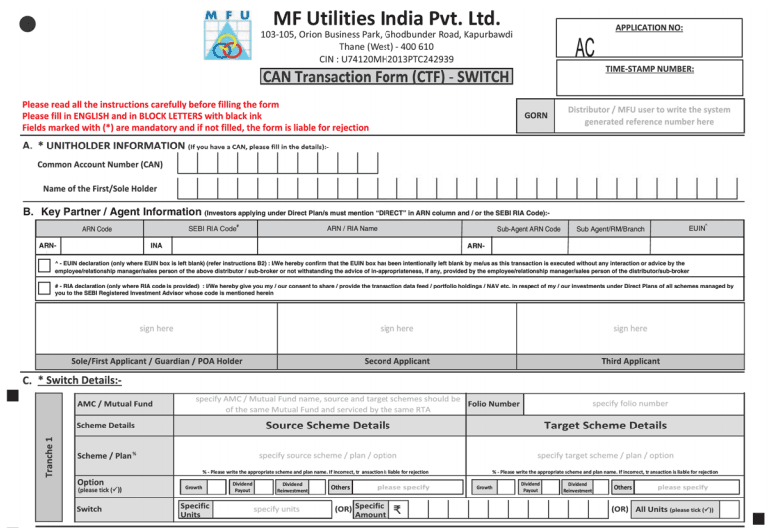 Fill up the form with required details along with source scheme and target scheme details. A sample form screenshot is given below. You can also use fillable form. Make sure all details are correct, especially source scheme, target scheme, amount and number of units to be switched. After verification sign it on the form and submit it to respective center. Collect the acknowledgment receipt as a proof of submission. Once transaction takes place you will get email and SMS intimation on register email ID/Mobile number. The second method of switching fund is an online method. This method varies from fund house to fund house. I have used online method of switching fund via myCAMS which is described below. Visit myCAMS site and log in using your username and password. From Top navigation, click on Transact icon. You will be redirected to the page where it will show various options such as Invest more, Redemption, Switch, Systematic Investment Plan, Systematic Transfer Plan etc. Click on Switch, you will be prompted to select AMC Name. 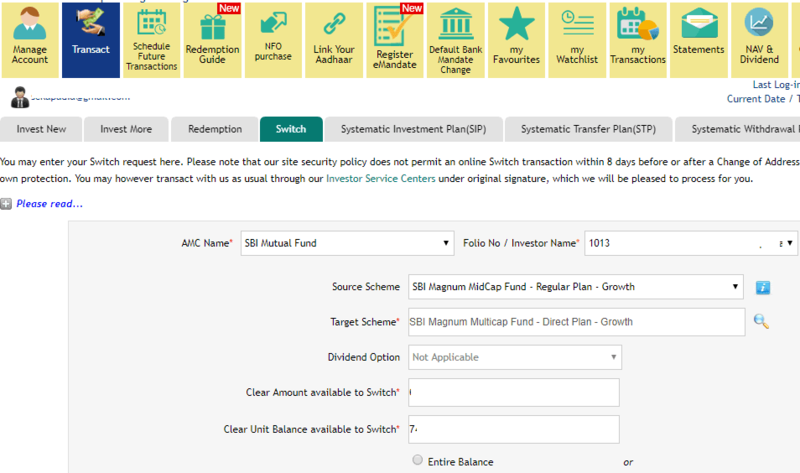 Drop down menu only displays a list of AMC where you are holding mutual funds. Select AMC and Folio Number. You will be asked to provide Source Scheme and Target Scheme. You have the option to switch entire balance or number of units. Accept terms and condition and press on switch button to initiate switching. You can also schedule this transaction at later date. On submission, you will get a confirmation page. The certain portals may ask transaction PIN or ask to re-enter your password for verification. Once the process is completed you will receive intimation on your registered email id and mobile via SMS. I hope the process of switching fund is now clear to you. If you have any query about switching fund feel free to post it in the comment section. I will surely try to answer it.